Let’s face facts, for as much grief as blade grinders get the bottom line is this: pre-ground coffee will never be as good as grinding whole beans at home. Once coffee beans are ground there is little time before they begin to go stale. Some experts say within a minute, the most important oil and flavor are compromised. Therefore, pre-ground coffee that’s been sitting on the shelf is definitely stale. Investing little money into a blade grinder is a good way to test the waters when it comes to investing in bulk beans. One quickly realizes the difference and their path to better coffee is paved in Arabica. So let’s discuss some of the best blade grinders out there for your money. Many coffee aficionados will hail the uniformity of grind as being responsible for consistent and better-tasting coffee brews. While the jury is out on the most important factor, it is important to grind a bean in a way that doesn’t disturb it’s flavors and oils. This grinder is one of many facets of great coffee grinding, and puts consistent grinds out despite it using a blade. 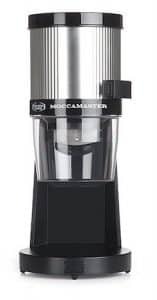 The Technivorm Moccamaster is an incredible blade grinder. This is thanks to the stainless steel blades which grind in the fan cooled grind chamber, allowing beans to be processed at up to fourteen ounces at a time. The turbo motor makes quick work of beans, and features it’s own factor adjustments to grind suitable for filter coffee. The KitchenAid Blade Coffee Grinder makes quick work of an variety of coffee beans, and enough for twelve cups of coffee at a time. There’s even subtle markings on the inside of the stainless steel bowl to show how much grinds you’ll have for brewed coffee. The clear cover is also a One-Touch control allows for operation so the job is done quickly. 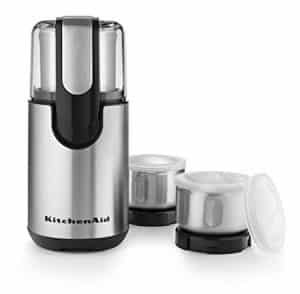 The KitchenAid BCG2211OB features a strong and clean looking build. The clear cover also allows you to easily see the consistency of grinds while. It’s a powerful performance, quickly grinding enough whole coffee beans to make up to 12 cups of coffee. The devils in the details and one aspect of blade grinders is that they rarely make transferring to a brewer easy. In this case the bowl lifts out, making it easy to transfer grinds to the coffee maker. 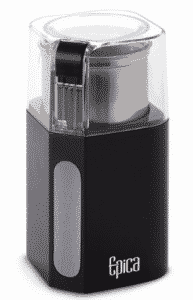 This little droid looking grinder is Cuisinart’s answer to the blade grinder phenomenon. Much simpler ease of use than its peers or even R2-d2, the safety lock on the lid, which also functions as a one-touch control makes for an amazing user-experience. This is a pain free operation, the grinds lift off in a stainless steel bowl to be delivered to your coffee maker and is easily cleaned and replaced for the next use. Though you’re not likely to achieve espresso-fine grounds, particle size is optimal for drip coffee and can be coarse enough for french press. 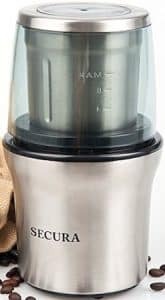 This is certainly affordable and it’s stainless steel build, even down to the blade makes it an excellent choice for grinding up to ninety grams of beans in a sitting. The Cuisinart DCG-12BC is one for an affordable price and offers a competitive grind. 200 Watts of power make the KingTop Fresh-grind better for quick grinding fury. It’s no wonder the beans can be ground into fine particles with just ten seconds of pulsing the blade. Basic coarse grinds are achievable in seconds, holding the one-touch control down longer means finer grinds. Rarely will you find a blade grinder that can process beans into a Turkish style grind, but this is the exception. With all that power one might expect to see a very ugly and industrial blade grinder, yet this is one of the more unique and aesthetically pleasing among the crowd. 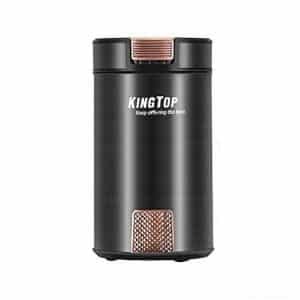 The Kingtop Fresh-grind is graced with a stylish black frame with bronze accents, this grinder not only looks god but is made durable, in case it gets dropped or knocked over. Consider this a special grinder. 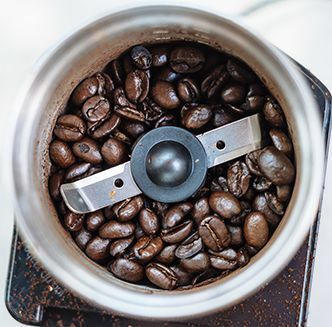 The Secura Electric coffee grinder can make easy work of grinding beans; Build-in smart overheat protection not only extends the lifespan of the motor, but also helps keep beans from getting ruined in the process. The stainless steel blade and stainless steel exterior are made to take whatever you throw at it. It should be noted that the stainless steel bowl can be removed from the blade grinder which allows it to chop instead of grind in the compartment. There are also two removable chopping chambers, both constructed from stainless steel. This makes finding a god grind size an easier and more explorable task. The hopper is smaller than others, but the dual blades and the power of the motor make this a sleek, compact blade grinder. A fine producer of coffee gear, the folks at Bodum seem to understand the broad ways that people around the world prepare their brew. 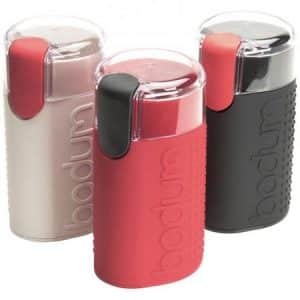 The Bodum Bistro blade grinder comes equip with a durable stainless steel cutting blade that spins at a precise RPM thanks to its 150W motor. Through the transparent lid, one can operate the grinder for the duration that creates their favorite grind, even down to fine espresso style. This grinder is small enough to leave on the countertop year round, but is powerful enough and has the capacity to grind enough coffee needed for brewing 8 cups of French press. Not only is this grinder efficient, it comes in a variety of stylish colors. Thus, it can grace your kitchen regardless of the motives of previous appliances. Hailed as Amazon’s most powerful grinder, one would hope this could live up to those kinds of accolades. One thing is for certain, the Epica coffee grinder is near silent. One of the biggest reasons people turn away from a blade grinder and go to a manual hand grinder is the noise level. Well, Epica has remedied that in the durable construction of the frame which dampens sound while looking modern on your counter. This 250 watt grinder packs the strength that many others simply can’t match. 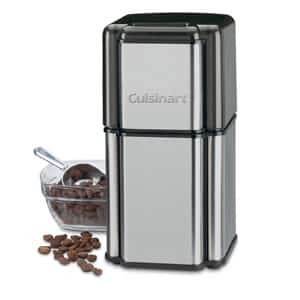 This combines ease-of-use and power to uniformly grind beans so quick, you won’t worry about damaging them with added heat. Who knew a blade grinder could be so efficient? So if you’re looking for a way to avoid stale coffee for good, and making the change to a large format burr grinder is a little daunting, give one of these great blade grinders a chance. Perhaps you’ll soon understand just how important a fresh ground coffee bean can be. check out our coffee gear as well, if this has prompted you to step up your coffee game. Also, if you are in the market for a bean grinder like these or maybe one of the manual coffee grinders which are similarly priced, you will probably want to get a good airtight storage container for your beans. We’ve got a good run-down of our favorite coffee storage containers here.